With two years of research in hand, poplars for bioenergy appear to be good for wildlife. Poplar trees are known to provide good habitat for many kinds of wildlife. In the past, deer, elk, and bird populations have dramatically increased in areas where large poplar tree farms were established for the pulp and paper industry. It was not known how poplars grown on short rotations for bioenergy may impact local wildlife populations. At the Jefferson, OR and Hayden, ID demonstration sites, AHB researchers have been monitoring wildlife for two growing seasons. The focus is on species that respond quickly to changes in their environments such as birds, small mammals, and pollinating insects. Monitoring is also being conducted in adjacent agricultural lands, such as wheat and safflower fields, for a comparison. 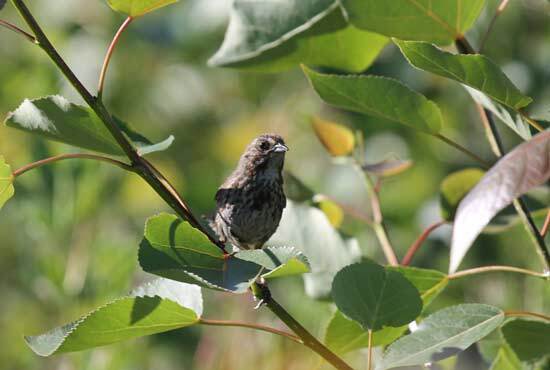 A song sparrow rests on a poplar branch at the Jefferson, OR demonstration site. Photo by Brian Moser, Rocky Mountain Wildlife Institute. In spring of 2012, monitoring started after the tree planting at both poplar sites as well as in nearby wheat fields. After the first growing season, wildlife abundance was similar between the young poplar tree fields and the wheat fields. Monitoring continued throughout the second growing season during the summer of 2013. The second season of data provides an indication of how wildlife populations will respond as the poplar trees mature. Total bird detections in the Jefferson, OR sites during 2012 and 2013. Birds were not detected in the wheat fields. 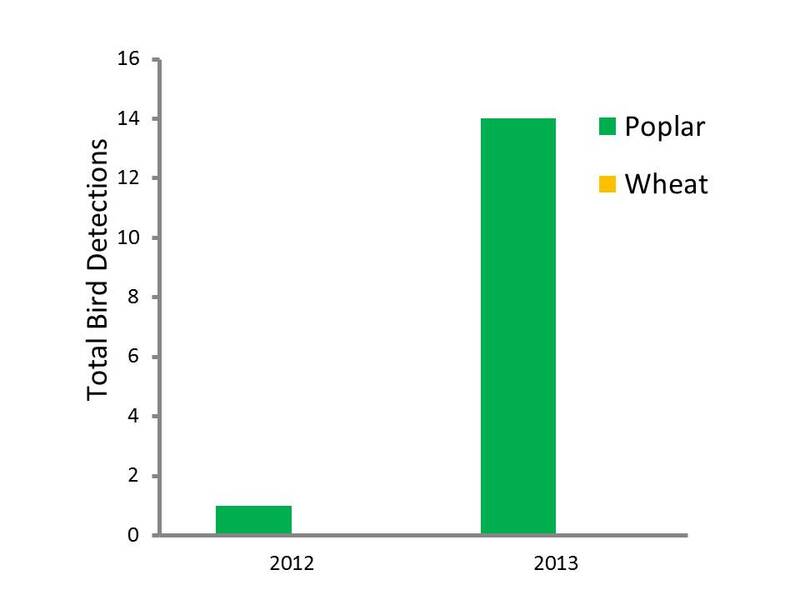 In 2013, song bird abundance in the poplars increased at the Jefferson site but not at the Hayden site compared to the wheat fields where no birds were detected. Birds observed in the poplars included Song Sparrows, Spotted Towhees, Lazuli Buntings , American Robins, Swainson’s Thrush, and California Quail. 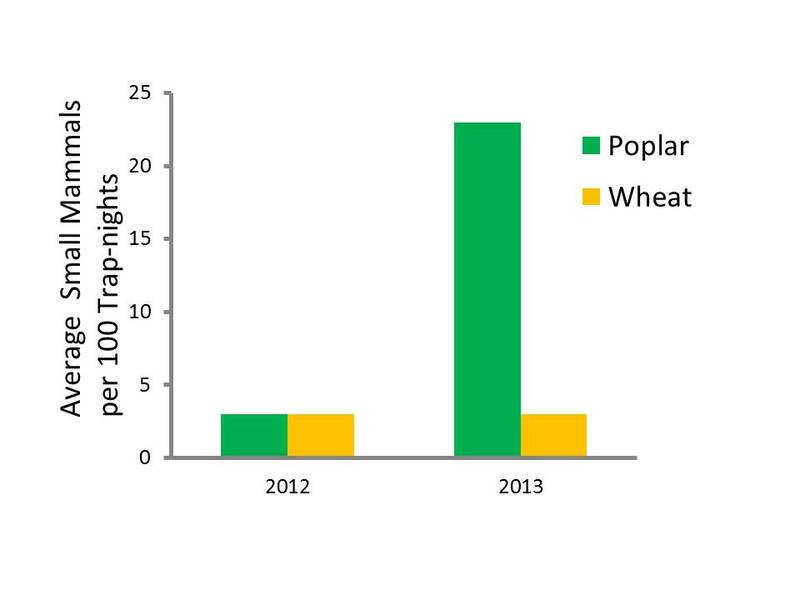 At both sites in 2013, abundances of small mammals significantly increased in the poplar demonstration sites compared to the wheat fields. Some of the mammals detected included deer mice (Peromyscus maniculatus), montane voles (Microtus montanus), long-tailed voles (Microtus longicaudus), and shrews (Sorex spp.). As poplar demonstration sites continue to develop, researchers expect to see more differences in wildlife abundance between the poplar sites and the wheat and also safflower fields. The expectation is that as the trees mature, they will provide more diverse habitats and semi-permanent vegetation. During the next three growing seasons, researchers will be investigating how harvest activities on two to three year cycles will impact wildlife species. Continuing research on wildlife at all four of the demonstration sites throughout the cycles of harvest and regrowth will help researchers determine cumulative impacts to wildlife. Their hope is that research results will help guide management decisions in the future as it pertains to poplar bioenergy farm establishment.